WesSpur stocks fall protection harnesses and shock absorbing lanyards for work situations in which the tie-in point is below the worker. The harnesses on this page are not intended for use as tree climbing harnesses, unless noted otherwise. These fall protection harnesses may be worn in addition to a tree saddle to provide an attachment point for a shock absorbing lanyard. Fall protection harnesses are most often used in the tree care industry when the worker is working in a bucket truck. In this situation fall protection must be worn. 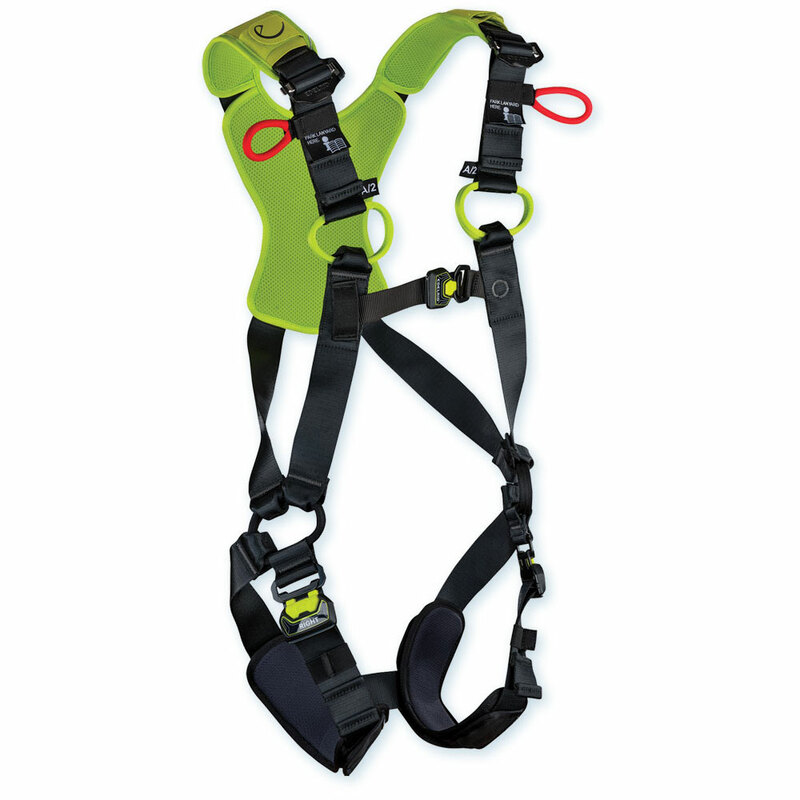 The lightest harness in the Flex series - low weight, easy adjustability and precise fit. The NEWTON EASYFIT fall arrest harness is easy to put on thanks to a the vest style and FAST automatic buckles on legs - no step-through required. The Newton is a comfortable fall arrest harness and quick to put on, making it great for bucket work. The hi-vis vest with reflective strips helps ensure the user is seen, and lets the harness keep its shape, making it easy to put on. This fall-arrest harness has both Sternal and Dorsal connection points for your fall arrest lanyard, making it versatile for multiple working environments. The Newton also offers ergonomic stowage of MGO connectors and has fall indicators. It is certified to North American, European and Russian standards. This is a special order item. If out of stock, please allow an extra 1-2 weeks for delivery. Great harness for tower access, line work, and arborist work, with built-in fall pro. Wide anatomical waist pad for increased comfort & back support. Easily adjustable for variations in clothing by use of camlock buckles. Attachment points at waist, hips, chest, back (lumbar) and back (dorsal). XL side positioning rings allow the user to easily make connections to safety belt. Chest harness specifically designed to incorporate a chest ascender (sold separately) for tower access work and is specially tailored to reduce neck chafing. Sizing (waist): SM 28-32", MD 32-36", LG 35-40", XL 40-46"
Shoulder pads available (SAD412) to make the harness more comfortable. The Petzl ASAP is a popular rope brake which can arrest a fall. Couple with the ASAP'sorber energy absorption lanyard for a shock-absorbing fall arrest system. The Petzl ASAP is sold with an OK Triact carabiner. For use on ropes from 7/16" to 1/2" (10.5 mm to 13 mm) and can be installed midline. Weighs only 15 oz including carabiner. The ASAP'SORBER AXESS energy absorber connects to the ASAP or ASAP LOCK mobile fall arrester to allow the user to work at a distance from the rope, in order to protect it during certain work phases. Equipped with tear-webbing inside a pouch that opens on each end, the absorber is protected from abrasion while allowing for regular inspection. Suitable for two-person rescue with a maximum load of 250 kg. Certified to U.S., European, and Russian standards. This 'H' style full body fall protection harness from Buckingham is designed to provide security and comfort. Features the Buckingham patent pending Quick Connect Buckles with leather chafe pads on the leg straps. The connectors on the chest are adjustable in height. A compact, steel dee ring provides dorsal connection point between the shoulder blades. Available in 4 sizes. Meets all applicable ANSI, OSHA, and/or ASTM standards. The Buckyard has the flexibility of a standard web or rope lanyard with the benefit of a reduced arresting force. The tubular nylon exterior may expand 42” maximum while the interior material stretches to reduce the arresting force to less than 900 pounds. The Buckyard is available in 4’ and 6’ non-adjustable lengths. Steel locking rope snaps on each end.